This home boasts 3,000 sq. ft for you and your family to relax and unwind from long days at the park. Walk into this home and you will find the large open floor plan easy for entertaining large families, and groups. The kitchen is fully equipped, and fitted with granite countertops and stainless steel appliances. 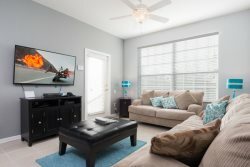 Adjoined is the living area with plush sofas, a large 59" SMART Cable TV and Blu-ray player, and a two separate dining areas with seating for up to ten. The property has one master bedroom located on the ground floor and an additional master bedroom upstairs on the 1st floor. Both have en suite baths with walk in showers and garden tubs for soaking. There are 2 queen size bedrooms with their own en suite bathrooms located on the first floor for added convenience aswell as a separate seating lounge area and Two other rooms complete the 1st floor with two twin size bedrooms for you to come home from long days at the park and unwind. To complete your experience outside you will find an inviting deck space complete with large pool, as well as an outside dining table with chairs and sun loungers and a view of conservation area directly behind. With all of this and more, this home provides everything you need to relax and enjoy your Florida vacation in style. Aviana Resort is an exclusive private destination conveniently located in Southwest Orlando within 10 miles of the Walt Disney World entrance. This resort offers a unique vacation experience that includes delightful amenities and stunning tropical landscaping from the comfort of your own beautiful private villa. The resorts amenities include swimming pool, spa, fitness center, business center, sand volleyball, children's playground and putting green. Escape to what has been called an amazing destination for the whole family with an experience like no other. Our quiet all inclusive family resorts is located in the in the Orlando area, just a short driving distance from the radiant beaches of Tampa, to all the theme parks your family could dream of. Here, your family can relax in a gated community specifically designed to have the comforts of home but the luxury amenities of a resort. Aviana Resortis an exclusiveprivate destination conveniently located inSouthwest Orlandowithin 10 miles of the Walt Disney World entrance. This resort offers a unique vacation experience that includes delightful amenities and stunning tropical landscaping fromthe comfort of your ownbeautifulprivatevilla. The resorts amenities include swimming pool, spa, fitness center, business center, sand volleyball, children's playground and putting green.